Considered “outsider” art. 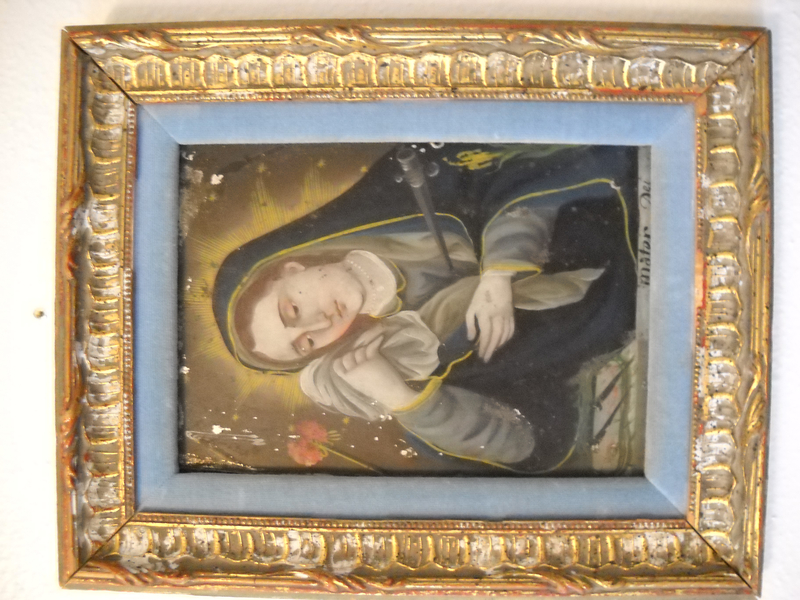 retablos and Ex Votos are typically created by a townsperson/artist who serves as the artistic scribe for the community and church. Both of the images above represent Mater Dolorosa, a foundational symbol of the mother of Christ in mourning. 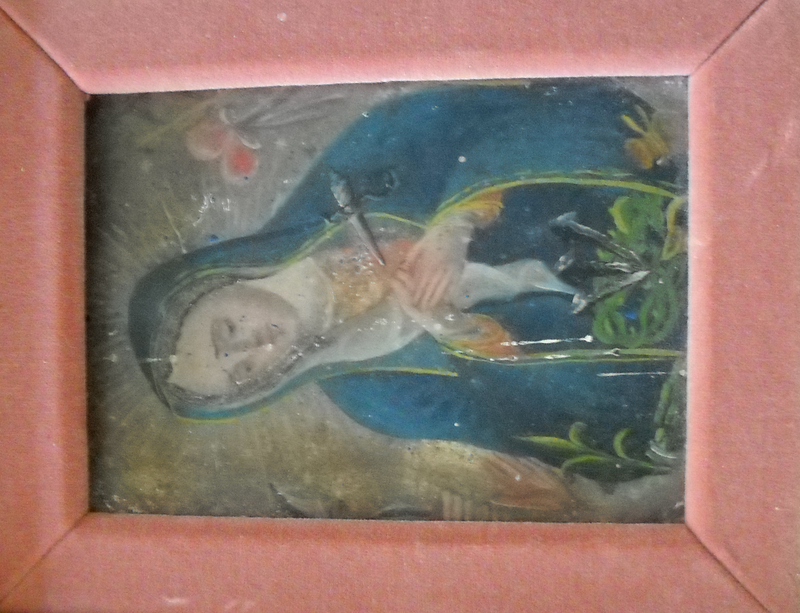 Both were brought to the US from Mexico in the 1930s, and are classic examples of the Retablo form. 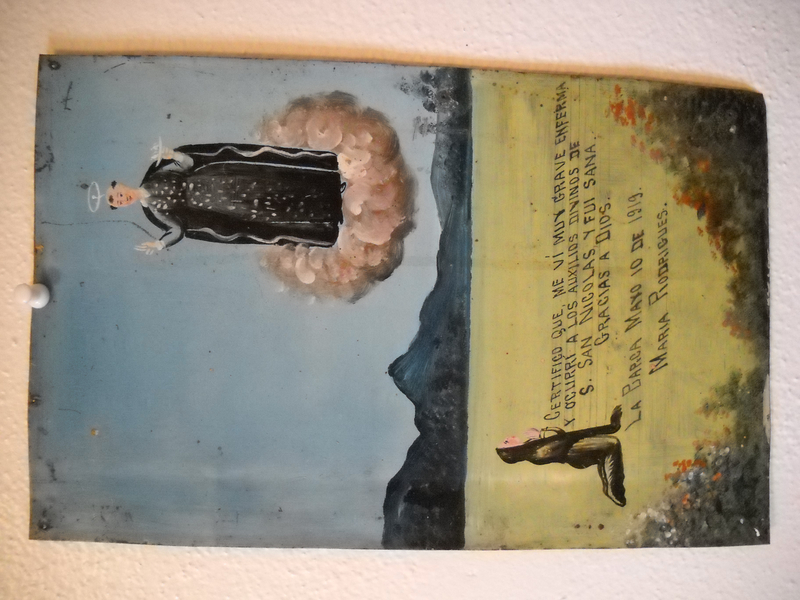 Retablos are often recreations of iconic Christian paintings, painted on license-plate sized tin panels, and nailed to the alters of rural churches in Mexico. Below is the Niñ0 de Atocha, another typical style and representation of the Christ child. 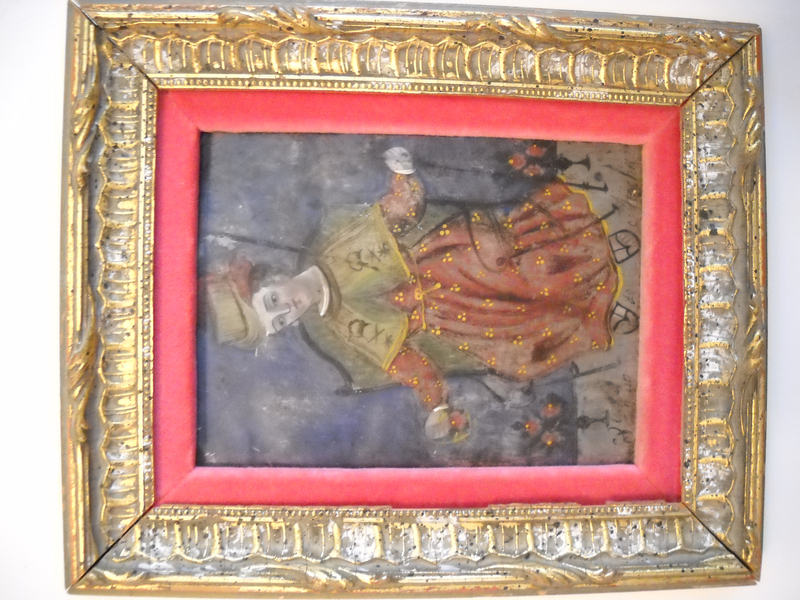 This piece also originated in Mexico and was brought to the US in the mid 1930s. I acquired these pieces at a gift and antique boutique in Chandler, Arizona in 2001. The term “ex voto” is translated as “my vow.” The form represents a vow of acknowledgment and testimony for the granting of a miracle of divine intervention. 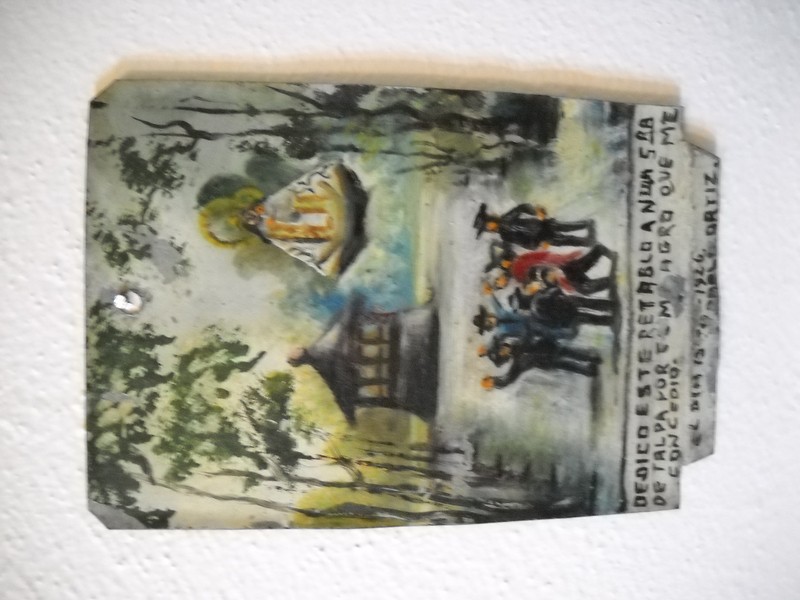 Typically these tributes were created and gifted to the community church after a turning-point episode in the life of a community member – whether it be recovering from typhoid fever (as is the case in the first ex voto below) or surviving a robbery at gunpoint as is depicted in another of the images below. 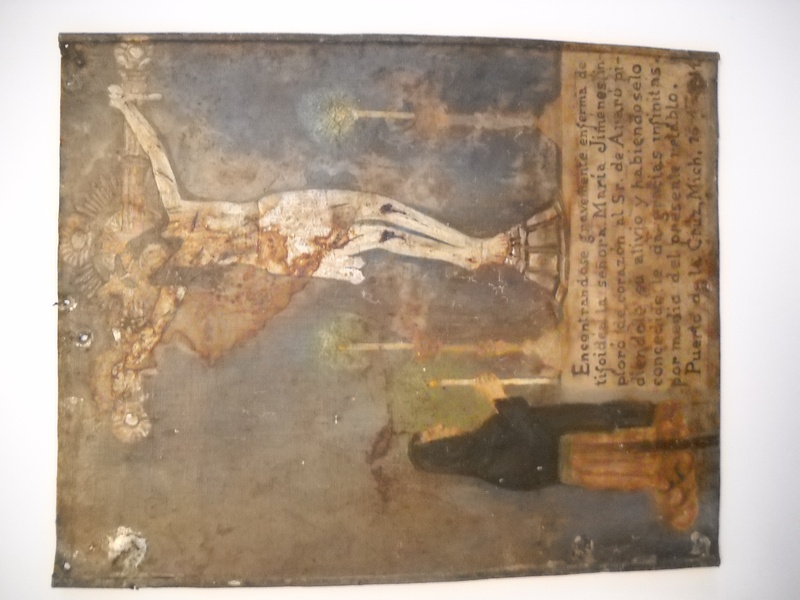 a translation of this piece tells of Lady Maria Jimenez who was gravely ill with typhoid fever, but was cured through the divine intervention of the Saint of Araro.